A Big Fun Run 5K is the perfect event to aim for in 2018. Whether you’re running for fitness, fun, or to fundraise for a fantastic cause, there’s something for everyone! With 20 events taking place across the UK, find your local one at www.bigfunrun.com. In January 2018, Chloe Jaques, 17, from Liverpool suffered from a sudden ischaemic stroke on the right side of her brain. “I had a stroke in my bedroom and collapsed on the floor. I was rushed to A&E at the Royal Hospital where they carried out an MRI scan and found a blood clot on my brain” Chloe explained. An ischaemic stroke blocks the blood supply to the brain and starves the brain of oxygen and nutrients. As a result, brain cells are damaged. The sooner someone is treated for an ischaemic stroke, the less damage is likely to happen. 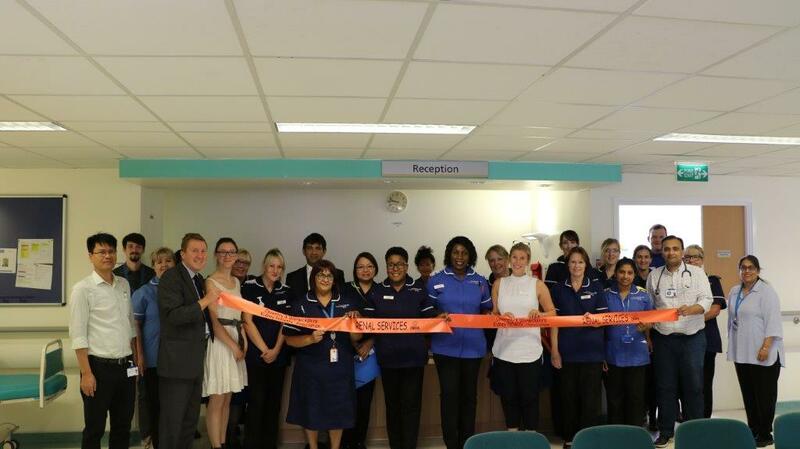 “I was transferred to The Walton Centre which specialises in Neurology and put into a medically induced coma for 2 days while they performed a thrombectomy and removed 90% of the blood clot”. Chloe’s stroke left her with swelling on her brain and severe weakness on the left side of her body. “I was unable to hold things in my left hand and couldn’t walk anymore. I thought 17 was too young to have a stroke but it turns out my age was actually on my side during my recovery” Chloe said. Fast-forward six months and Chloe is taking part in her first 5k event at Big Fun Run in Croxteth Country Park on Sunday 19th August raising funds for The Walton Centre as a thank you to the trust for saving her life. “The Walton Centre’s Neurology department is one of the biggest and busiest in the UK and they are the people that saved my life”. “The care I received from the amazing nurses there was incredible. I then spent 3 weeks in the Stroke Ward at the Royal Hospital after my surgery at The Walton Centre and learned to walk again and work on building the strength back in my left arm and hand”. “I am now able to thankfully walk as normal but have limited use of my left hand and suffer from extreme fatigue. Despite this I am determined to complete my first 5K!”. 6 years ago, Alison Pickard, 61, from Retford’s life was turned upside down when she was diagnosed with Motor Neurone Disease. Motor Neurone Disease is a degenerative condition that affects the brain and nerves. Over time, it causes weakness and loss of function in arms, legs, speech, ability to swallow and, eventually, breathing. There is a 1 in 300 chance of getting MND and there is no cure. “It’s been difficult losing friends I have made who have MND but deteriorated more quickly than me. I have several more friends who are now cruelly limited by this horrendous disease”. Alison decided to do something positive and say thank you to the charity who have supported her throughout the years following her diagnosis and has signed up to complete 5k at Big Fun Run in Rother Valley Country Park on Sunday 12th August. 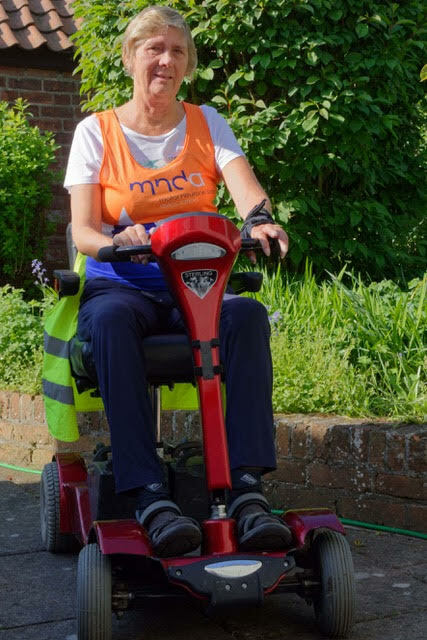 “I will be taking part on my mobility scooter because MND long since took away my ability to run” Alison explained. Having received contact details for the Motor Neurone Disease Association after visiting Sheffield Hallamshire Hospitals’ specialist MND Centre, Alison reached out to them for support. “I was visited at home by one of the Regional MNDA Care Coordinators who was absolutely lovely and really made us feel much less alone with my diagnosis”. “We now attend the local support group through which we have met other people living with MND and there is a dedicated helpline available”. “When I bought my mobility scooter the MNDA gave me a sizeable contribution towards the cost. In short, I basically cannot imagine coping without MNDA” Alison said. Alison has never taken part in a fun run before and explained “I thought it would be nice to do some fundraising for MNDA and give something back. I saw the Big Fun Run advertised and decided to give it a go!”. “As I tend to be known by my grandchildren as “Scooter Grandma” I’m looking forward to the Big Fun Run and living up to my name”. A group of 7 colleagues from Charities Aid Foundation in Kent are completing 5k together at Big Fun Run in Mote Park on Saturday 4th August in aid of Children with Cancer UK. 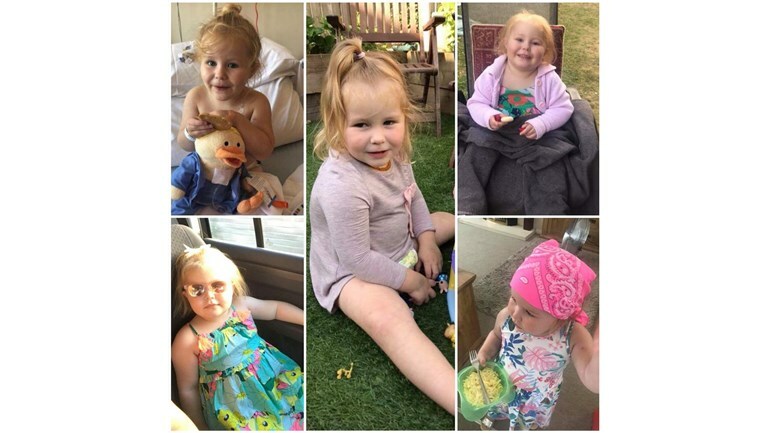 2 year old Imogen Montague was diagnosed with Acute Lymphoblastic Leukaemia in June 2018 and a group of mum Kelly’s friends and colleagues have rallied together in support. “Imogen has been such a tough little cookie and is dealing with all that’s thrown at her amazingly” family friend Vikki Denny explained. “Life is pretty much on hold for Imogen and her family for the next 2 years until her treatment is over. Kelly hasn’t been working since Imogen’s diagnosis and her brother Brody is feeling the impact as Kelly needs to spend a lot of her time caring for Imogen”. Vikki and her colleagues decided to do something positive and entered Big Fun Run to raise money for Children with Cancer UK. “After finding out about Imogen’s diagnosis we couldn’t imagine how her family were feeling and really wanted to do something to help other children and families in this situation” Vikki said. 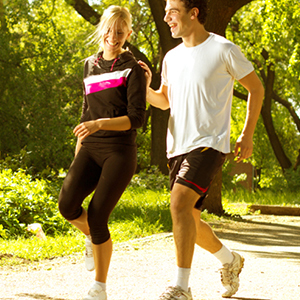 “Our team have been going on regular walks and jogging both during lunch breaks and outside of work”. With an original target of £250, Vikki and her colleagues have smashed their fundraising and so far raised an amazing £1070 to date. “We are raising this money for Children with Cancer UK in honour of beautiful and brave children like Imogen”. 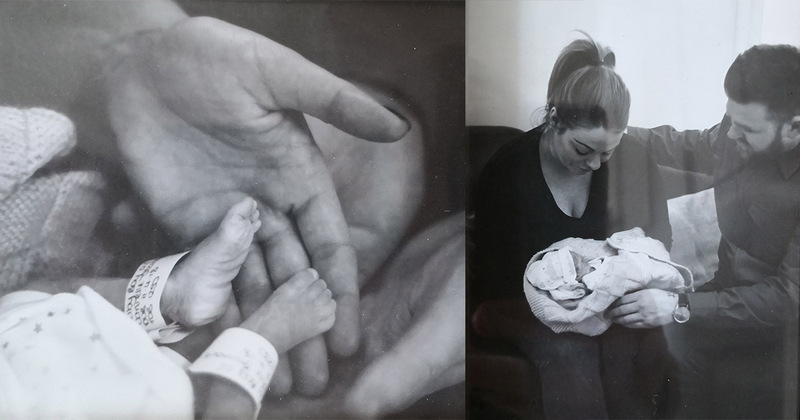 Along with their friends Spencer, Lauren and Jade, Shaun and Dani are fundraising for SANDS to help them continue to provide bereaved parents with essential support. “Until this happened to us, we were completely unaware of the extent of this situation and everything bereaved parents have to go through” Shaun explained. Shaun and Dani were given a Bereavement Pack created by SANDS which includes essential information and advice when needed the most. They also received a “Remember Me” Box to save treasured memories of their son. The couple were also welcomed to support groups both in person and on Facebook. “Dani has been using the Facebook Group she is part of a lot and is really benefiting from it with people putting her mind at ease by sharing their stories too. The help and support on offer is truly amazing” Shaun said. Having never completed a 5k run before, the group are currently taking up some training to complete their Big Fun Run the best they can. “We see this as a challenge and are doing so to try and raise as much money as we can to help this charity and raise awareness of what they represent” Shaun explained. “Any donations would be greatly appreciated not only by us but by SANDS and Franklin too… you’d also be paying to have a little laugh on our behalf”. 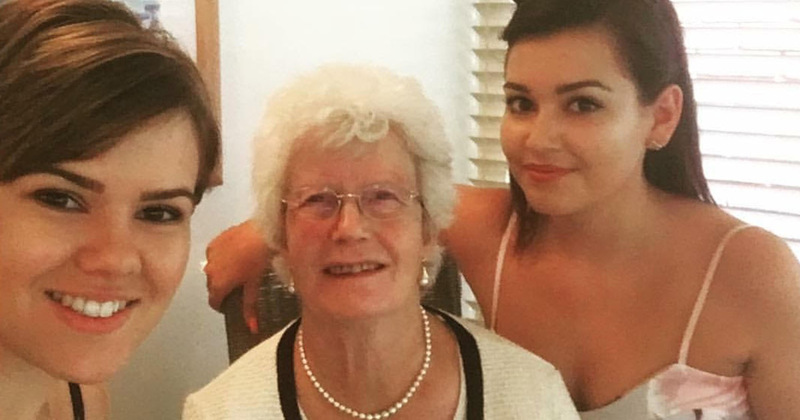 Southampton sister’s Alexandra and Francesca are gearing up for their Big Fun Run 5k on Sunday 15th July and are fundraising for Rowans Hospice in memory of their Nan who sadly lost her battle with cancer in April 2018. With Big Fun Run taking place on what would have been Nan’s 82nd birthday, Alexandra and Francesca aim to raise as much money as possible for the charity that provided much needed support and comfort whilst Nan lived with her terminal illness. “Nan battled to keep going for as long as she could and during this time spent one day a week at Rowans Hospice. If you knew Nan, you’ll have heard just how much this day meant to her and how much she looked forward to going” Alexandra explained. Nan was treated to pampering, home cooked meals and friendly faces to chat to all funded by the charity and provided by passionate volunteers. Alexandra said: “I really believe this place gave her a little bit of life in her last year and allowed her to cling onto a little bit of independence away from her family”. With a fundraising target of £500, Alexandra and Francesca want to say thank you to The Rowan’s Hospice for the care they gave their Nan and to help ensure they can carry on providing wonderful care and respite for families such as theirs. With their parents and family coming along to support them on their big day Alexandra said “I know Nan would have been there to support us if she could, and I think she’ll be watching over from somewhere”. To find out more and support Alexandra and Francesca’s fundraising for Rowans Hospice visit: https://www.justgiving.com/fundraising/alexandra-drew. 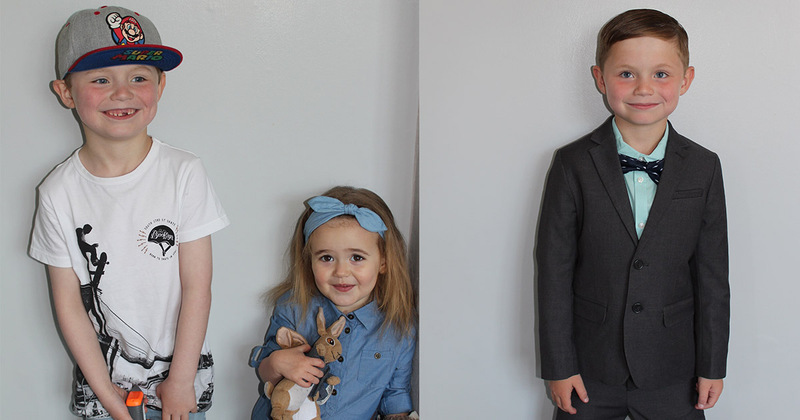 Katy Rogerson, her husband Steve and their two children Jessica, aged 9 and Benjamin, aged 6 are taking part in Big Fun Run Crystal Palace this weekend to raise money for family friend Catriona’s cancer treatment. Katy and Catriona have been best of friends for nearly 25 years and have remained close ever since they met back when they were teenagers. Catriona lives in Ireland with her husband Jon and has 4 children aged between 10 months and 8 years old. 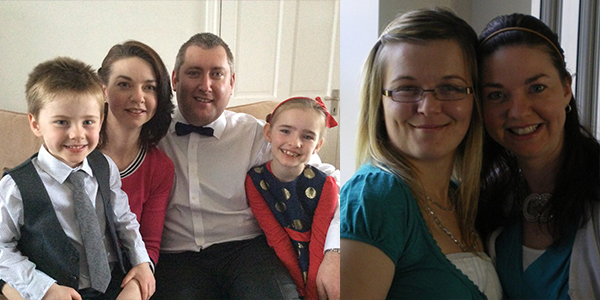 Aged only 37, Catriona suffers from aggressive osteoporosis which has resulted in her developing serious spinal fractures after a complication during one of her pregnancies. As well as a blood clot on her lung Catriona has devastatingly found out she has cancer with a large tumor growing rapidly on her kidney. 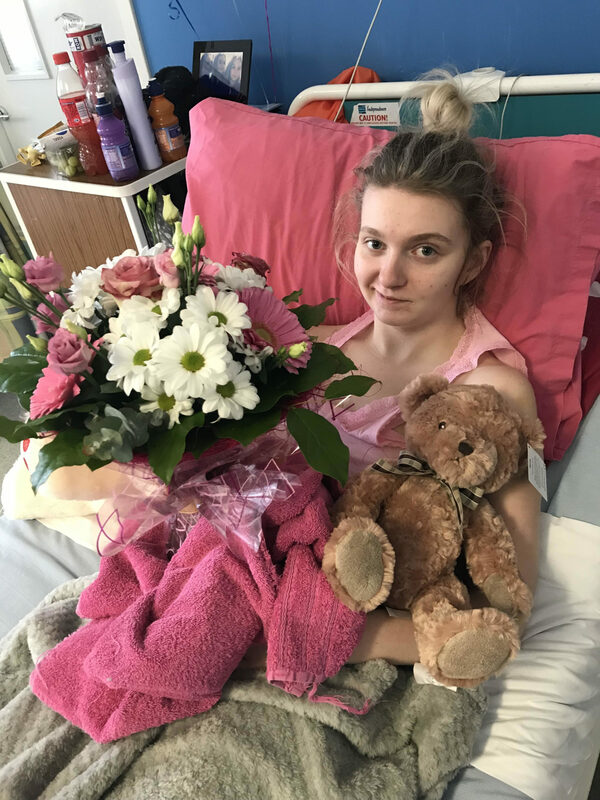 Catriona’s family and friends are rallying together to raise funds to help her complete life-saving treatment in Germany and hopefully save her kidney. The treatment Catriona requires is currently unavailable in the UK. “Catriona doesn’t focus on her problems and continues on with a positive attitude. She is always smiling and is a great Mum to her lovely children. She has always been there for me over the years and is an amazing friend. I would do anything for her and this little bit of fundraising I can do will really help” Katy explained. 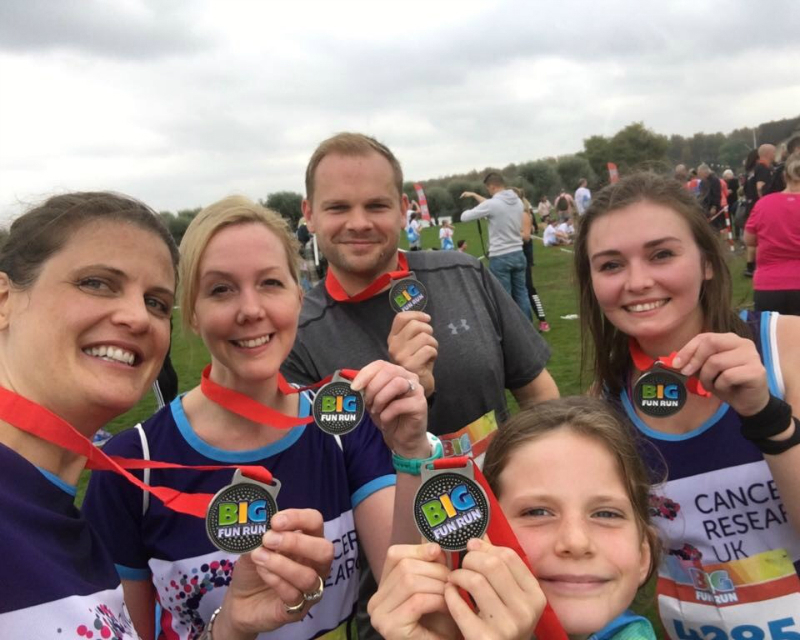 The Rogerson’s wanted to do something together as a family and they love spending time at Crystal Palace Park making Big Fun Run an ideal fundraising challenge for them. Reflecting on their 5k challenge Katy said: “This is quite a big challenge for us as we are a family who loves staying at home and watching films. We have been doing a little training trying to get more active by visiting our local green space, outdoor gym and taking the kids out on their bikes to prepare for the challenge. To all those who would do anything for their best friend, we would be so grateful for your help”. Shout out to Team FMI who completed Big Fun Run Milton Keynes to raise money for our Official Charity Partner Cancer Research UK whilst having lots of fun along the way! FMI are a small brand engagement agency with a fantastic close knit team of people. Sadly earlier this year FMI’s Finance Manager Kathryn and Event Director Dave’s wife Emma, were both diagnosed with breast cancer. Team FMI took part in Big Fun Run to raise funds to continually invest in curing cancer and support their fellow colleague and friend during this difficult time. Leading up to the event, Team FMI have been busy keeping active in preparation for their fun 5K including spinning classes and swimming, to long walks with their dogs over fields and the the odd jog about town. “As a team, we’re a fantastic mix from an individual who have completed half marathons, to someone who swears she can’t breathe when she runs – we are definitely a group of mixed abilities fitness wise but were all determined and committed to crossing the finish line together” said Clare.